"I 'found' Bridget after a couple of disastrous sessions under other trainers. I contacted her as I needed help bringing my horse on under saddle. She, very patiently, listened to my (not so) brief on what I had been doing with him and watched me as we went through our current training. She gave a very thorough lesson and offered relevant and helpful corrections and advice. Bridget has a wealth of experience with horses and a variety of training experiences which means she is able to tailor a training plan that suits the horse and rider rather than expecting the pair to fit the plan. I highly recommend Bridget to any improving or struggling horse and rider combination. She absolutely has the horse's welfare in her sights and is a friendly and empathetic instructor. She listens to the person, communicates clearly and does so without any form of ego." "I have been looking for the right trainer for such a long time, and despaired of finding "the one". I'm not a fan of the "whippy, kicky, Alpha, show'em who's boss" brigade but it seemed that was all there was in my area. And then my lovely friend Kelly recommended Bridget. We had our first lesson yesterday and it was such a breath of fresh air. Bridget was kind, calm, quiet, and very understanding of my Fjordie mare, and pointed out a lot of things that, yes, we should all know but we don't all think of. Well, I don't anyway. And then more that I didn't know. I'm already a fan. Onwards!" "You're a natural teacher and your enthusiasm for making life better for our horses is second to none. " "Complete Horsemanship Discussion Group: What a great idea Bridget had in bringing together horse owners and riders to chat socially. But it was so much more than that! Bridget sensitively created a forum in which we could share experiences with people who empathised rather than judged, with Bridget chipping in to explain why things might have happened. Would I go again? Definitely YES!! I was a bit doubtful about giving up a chunk of Saturday but the timing worked well for me as I could see to my horses before and after; and I left with a real, feel good factor. And I met lovely people who I'd like to spend more time with. And there was lots of cake!" "Thanks so much for the leadership notes they will be very useful and thanks for the brilliant session last week. You are truly inspiring and I only hope I can get it right, with practice." "Thank-you so much for (the) session at the College of West Anglia. In response to your email, it was everything I had hoped for ... and more, so thank you!" "Wonderful! I am truly impressed with how you work with Penny and how natural it seems to be to you, to do the right thing at the right time that she understands and co-operates with." "I am really impressed by your knowledge and your appraisal of each horse's situation. The horse's response to you is enviable, but very inspiring. The most striking thing is your ability to communicate with both us, and the horses." "I wish I had followed these methods years ago. I've really enjoyed the whole learning experience, seeing the positive results have made me want to understand more. You have been such an inspiration to me." "Knowing that I have your help means that I know I will have the horse that I want and that I will be able to be the best person for him. Thank you!" 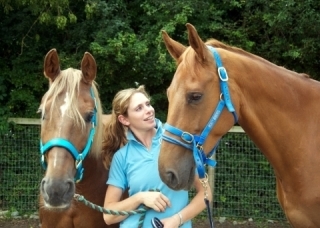 Bridget is an inspiring and natural teacher, passionate about helping horses and their owners. At the heart of her training is a desire to make it easy and pleasant for the horse to want to work with us. Always motivated by the well-being of the horse Bridget draws on a variety of techniques in order to make it easy for the horse to do the right thing. She doesn't necessarily follow a set system, but will adapt her techniques to each horse and its owner to find the best outcomes. With a vast wealth of knowledge built up over a number of years, Bridget will cover everything from the horse's physical and mental health, its environment, management and feeding. As good with people as she is with horses Bridget will leave owners with 'homework' that allow horse and owner to progress with confidence. Bridget has been a full time Recommended Trainer of Intelligent Horsemanship since 2010 and became a member of Monty Roberts UK Tour Team in 2011. In more recent years Bridget has furthered her training and moved towards Classical Dressage techniques, she is an Enlightened Equitation Teacher, as well as a Straightness Training Mastery student. Whether you are experiencing ridden or ground handling issues, perhaps you have a horse who is bargy, or you are struggling with leading, loading, mounting, clipping, hoof handling for the farrier, spooking or catching problems; or maybe you would simply like to learn a new skill such as long lining or in-hand work; have you lost your confidence or do you feel that your relationship with your horse could be improved, or you would simply like to learn more about what makes him tick? Or you'd like to learn more about riding in an empathetic way which is focused on synchronising our movement with that of the horse for a more harmonious partnership. Bridget also really enjoys working with feral or unhandled horses. Whatever horse help you need, Bridget Colston Complete Horsemanship can help with all of the above and more. These courses are tailor-made incorporating groundwork and ridden training; an opportunity to work on a specific 'issue' or just spend quality time with your horse and build your relationship in a friendly and relaxed environment. Only two or three participants per course, ensuring maximum individual attention. From £350 per participant. * (There is some flexibility on dates - these courses have also been run as two or three day events. Please let us know if a shorter course would suit you better; there would clearly be some reduction in cost in this case). Bridget offers horsemanship training - ways that you and your horse can work together to promote a happier, more trusting relationship. This includes long-lining and in hand groundwork, with the emphasis on promoting a better way of going in your horse, and correcting natural asymmetry. 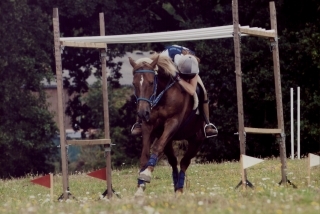 Problematic behaviours worked on include leading, ground manners, spook-busting, loading, catching, difficulties with leg handling, head-shy horses, clipping, unhandled or feral horses, as well as ridden issues such as napping or hacking confidence and many more. Bridget prefers to work with loading problems in a subsequent session after an initial assessment; which will allow an opportunity to cover preliminary groundwork and leave owners with any necessary 'homework'. This is also an opportunity to look over your vehicle and the facilities available to see whether any modifications or alternative arrangements need to be made. Loading sessions booked without a prior initial assessment session will be four hours and are charged at £150 (plus diesel) for the session. Click here for more pricing information. If a four hour loading session is booked Complete Horsemanship reserve the right to not proceed to actual loading training if to do so would be unsafe or detrimental to the horse's well-being. Whilst many loading issues can be solved in a single session, many horses will need gradual incremental training, and so a series of shorter sessions may be more appropriate. Quick fixes may seem impressive but lasting solutions are much better! Loading sessions following an assessment session are usually two hours and charged at normal rate. Bridget is an Enlightened Equitation Teacher (Level 2) studying under Heather Moffet and offers ridden training based on these principles. Bridget also offers horse exercise for those busy times when you aren't able to ride as much as you might like - this can be hacking, schooling, long-lining or groundwork. Complete Horsemanship is based near Yoxford, Suffolk, and predominantly cover Norfolk, Suffolk and Essex - but will travel further afield if needed. Most people prefer to work in their own environment. An initial consultation will include a full assessment of you and your horse in order to start finding the possible causes behind any behavioural issues. There are wonderful facilities here for you to use! Bring your horse here for an hour, a half day, a day or even a two day visit. Facilities include fully enclosed stable yard with large airy stables, a 20m x 40m all weather sand and rubber school, a surfaced 50ft round pen, and paddocks with external post and rail fencing. Training Livery starts at £250 per week for grass livery and five training sessions per week. (£300 per week for stabled livery). Bridget specialises in Rehabilitation Livery - bringing horses back into work after illness or injury, or with an excellent team of professionals on hand, Bridget can take your horse on livery while physical investigations are conducted. Individual packages to suit so prices vary. Bridget firmly believes that pain or discomfort is at the root of the vast majority of 'behavioural issues'. Horses have limited ways of letting us know when all is not well in their world. Frequently, Bridget finds that her role is to help owners come to an understanding of why their horse is behaving in a certain way, and then guide them in the right direction to seek further help. Many has been the time that a horse has been diagnosed by vets as 'behavioural' but with further investigation and a bit more digging in the right direction it has proven to be anything but the case. This work is hugely rewarding but as the exchange of e-mails, telephone calls or watching video evidence is time-consuming, this work needs to be chargeable. This is a good option for people who perhaps don't need a visit but feel they need some advice, or for those a long way from me. If you e-mail with the nature of the problem you will receive a series of questions to help get a fuller understanding of what is going on. Video footage, if available, can be useful. A telephone appointment will then be arranged. This service is charged at £20 but if you follow up and book a home visit, £10 will be deducted from the cost of the initial session. Intensive four day courses starting and finishing at lunchtime on the first and last day. Only three horse and rider combinations on each course, a brilliant opportunity to work through an 'issue' you might be having or just build on your training in a relaxed but safe environment - and at £300 for four days a really economic option. You are welcome to camp on site in a lorry or tent, or a list of lovely local B&Bs can be provided. Are you just looking for a relaxing break with your horse? Ideal for two people who will have an hour session each day to work on whatever aspect of horsemanship you might like. The rest of the day is your own; directions can be provided to wonderful local beach and forest hacks. Clinics can be organised at your yard, or here in Yoxford, and will be tailor-made to your requirements. Talks to schools, colleges or riding clubs can be arranged and are charged at £40 per hour plus mileage. Mileage charged at 45p per mile (50p per mile if bringing my trailer). Shared wherever possible. If you are based in Southern Essex and I am over-nighting in Essex I will charge you diesel from a postcode in Leigh-on-Sea rather than my home address in Yoxford, Suffolk. 1. What is the best way to make contact? Email is by far the most reliable way to make contact with me. I work long hours so it can be tricky to get hold of me on the phone. However, emails often seem to go into people's spam folders, so please make sure that our address and/or domain are added to your Safe Senders list. If you haven't received a reply within 7 days, do call or text. Between 6 and 9pm weekday evenings is the best time to catch me on the phone. Please include a mobile or landline number in your email, so that we have another way of getting in touch. 2. What equipment/facilities do I need for my initial assessment session? You really don't need much. All we need to work in, is a safely enclosed area on a good footing. A manege is ideal but a small paddock is fine too. If you have four trotting poles (or something similar) to hand these are sometimes useful. You will need your hard hat and gloves and some sensible footwear. Your horse just needs his ordinary headcollar and a long lead rope (but I will bring these too). It is unusual in a first session to get as far as ridden work but you may want to have your tack to hand. 3. Should I have my horse in and ready or would you like to see him/her in the field? Ordinarily, I recommend having your horse in ready for your session to maximise the available time. However, if bringing your horse in is an area you would like to work on, it may be useful for me to see this. Likewise, because of the nature of my work and the distances I travel my timings are a little approximate - if your horse is likely to get upset waiting around then by all means leave him or her out. I would much rather greet a happy relaxed horse than a stressed one. 4. Why are initial assessment sessions two hours long? This seems like a lot. You will be amazed how quickly two hours will fly by! We won't be working with the horse solidly for this time, as there will be a certain amount of discussion - it's likely you will want to tell me about yourself and your horse and the issues you are facing, and I will need to explain the psychology behind the way I work. I feel this is really important as if I only teach tools and techniques you will need tools and techniques for every problem that arises, whereas if I can teach the psychology behind what we do it's likely you can become your own problem-solver. We may also need to look at tack and feed and so on. 5. Do you guarantee success in a single visit? Absolutely not! An initial assessment session is just that – an assessment of the situation and an opportunity to create a plan to move forward. Sometimes before real ‘behaviour training’ can begin it may be necessary to make some other changes – for instance diet, management, saddle fitting, veterinary or physiotherapist intervention may be among the things that I feel need to be considered before we embark on training. Some behaviours have developed over many years and are deeply ingrained and may take a period of time to gradually re-train. Modifying behaviour should never be about quick fixes and truthfully quick fixes are unlikely to be long term solutions. All that said, there are times when one session is all it takes to make quite profound changes. 6. What equipment/facilities do I need for my loading session? We need a safely enclosed area where we can park the trailer or lorry, and have room to do some groundwork near the vehicle. Concrete or other hard surfaces are not suitable, and knee deep mud isn’t ideal! If you can park in a manege that is ideal, but otherwise a paddock (preferably with shortish grass!) is fine. If you can have four trotting poles to hand, or something similar – old fencing rails for instance – these are useful. If using a trailer this will need to be hitched up to a suitable towing vehicle, and ideally have the central partitions removed. You will need a haynet ready filled and some other food with two buckets. Chaff is the ideal food but sometimes something a little more interesting is necessary. The food is not used as a bribe but in order to create a pleasant association. It can be useful to have a third person around to help with things like lifting ramps - as long as this is someone quiet who is happy to be given direction, that you feel comfortable to have around. You and any helpers will need hard hats and sensible footwear. You may wish to have protective boots on your horse but I do not recommend travel boots. 7. Can my friends come and watch? Yes, as long as you are happy for them to. 8. Do I need to buy a Dually headcollar? No. If we decide to use on one the day I will provide it. But you may find yourself wanting one! 9. Do you share diesel costs between people in similar areas? Yes, I try to make my driving time as efficient as possible and keep diesel costs down. Please help me with this by keeping your appointments. I have standardized diesel costs by area. This means that you will pay the same amount each time regardless of how many people I see in your area. In the past I worked it out depending on numbers but this gets very complicated when people cancel. There will be a minimum number of people to make visits viable when I am travelling long distances. If you are based in Southern Essex and I am over-nighting in Essex I will charge you diesel from a postcode in Leigh on Sea rather than my home address in Yoxford, Suffolk. I ask that you pay the diesel share and a £10 deposit in advance by bank transfer - this is non-refundable but in exigent circumstances may be carried forward in the event of needing to postpone. The remainder is payable by cash on the day. 11. Why do I need to pay the diesel share and ten pound deposit in advance? Wherever possible I try to share diesel costs between people in similar areas to keep costs down. However, in the past where people have had to cancel at short notice, unless I pass this additional cost on to other clients, I am left out of pocket. I travel long distances and as such it is sometimes only possible to visit two people in one day - when one cancels I have often found the other cancels too rather than pay all the diesel; leaving me with what would have been a full day's work suddenly a non-earning day. Your diesel is therefore non-refundable if my day of training goes ahead for other people in your area. This works in your favour also, in the event that someone else cancels you won't find yourself with a bigger bill unexpectedly. It means 'shared diesel' visits can be guaranteed, where before they could not. Whilst I fully understand that life often has better ideas for your well laid plans and recognise that cancellations/postponements are unavoidable at times, it is often impossible to re-book sessions at short notice. It can be very time consuming when one person cancels for me to then contact every other client, for that day, to see if they can move earlier or later to fill the gap in my day. Your ten pound deposit covers this administration time in the event that you need to cancel your session. 12. What happens if the weather is bad? I try to keep going regardless of the weather. The exception to this is where to continue would be unsafe. When working with loading problems, for example, high wind and heavy rain which make conditions slippery under foot are just not safe and I will not continue to the detriment of the horse. This is the case also when backing youngsters. 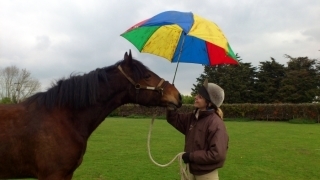 There are times that I can help with certain issues by talking things through, so it may be possible to do a 'theory session' in extreme bad weather – maybe over a cup of coffee in the tack room?! 13. How long are follow up sessions? Follow up sessions are usually an hour, but sometimes two hours may be more appropriate, and may well be more economical for you.